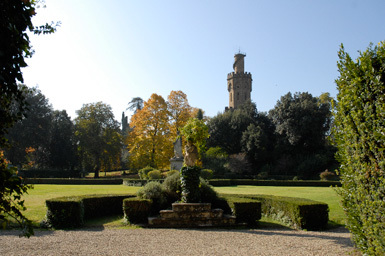 Renowned in the sixteenth century as a botanical garden it had a revival in the early nineteenth century when the Marquis Pietro Torrigiani inherited the property and started acquiring the surrounding land. 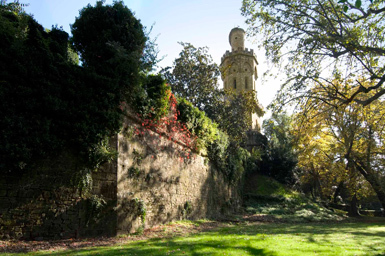 This he transformed into a ‘romantic park' in the english style, adhering to the fashion of the time, which covered an area of 25 acres. 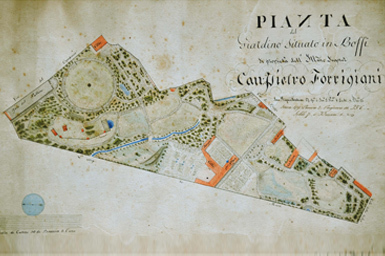 The architect Luigi de Cambray Digny, who had recently renovated the Oricellari gardens to much acclaim was commissioned to re-design the garden. 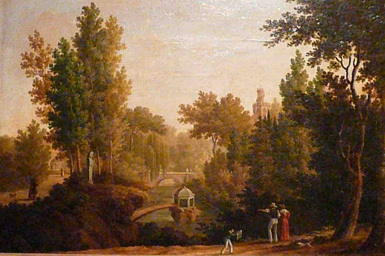 This he accomplished cleverly combining natural elements with artificially made landscaping and managing to include many symbols of an esoteric nature. 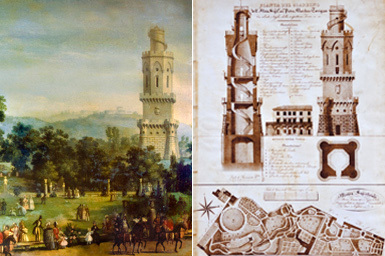 After Digny the architect-engineer Gaetano Baccani was engaged and following his success in designing the bell tower for the church of Santa Croce he incorporated a neo-gothic tower which alluded to the family crest. Almost twenty-two metres high, it housed a collection of astronomical instruments, a library, and a terrace from which to study the heavens. Connecting the floors there is not only a stone spiral staircase but also a mechanical chair activated by pulleys which permitted a speedy ascent. 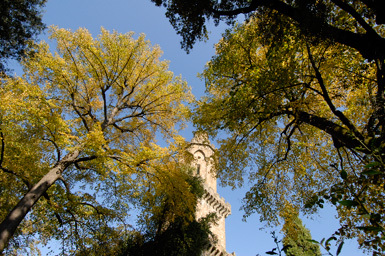 Nearby, below the artificial hill, is part of the original defence bastion erected in 1544 by Cosimo I dei Medici. The visitor is lead on a sentimental journey through the dark ’sacred‘ wood surrounding the crypt, symbol of the transience of earthly life, to the open spaces around the temple of Arcadia, symbol of pastoral life. On through hills and dales, out onto open grass, it is easy to imagine surprising a deer as often happened in the past. On the way is the charming gymnasium, the aviary and the delightful romantic bridge over the bed of the Ladon river. 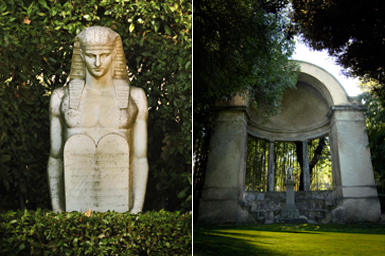 At the entrance to the garden is a statue of Osiris holding the tablet of rules of behaviour for visitors to the garden. There is a baroque piece by Baratta representing Actaeon who flees after seeing Diana’s face, the group in ‘greek chisel’ marble depicting a bull killed by a lion, the statues of Janus and Aesculapius, the Pio Fedi' statue of Seneca with the young Pietro Torrigiani, and the marble column dedicated to the great botanist and mycologist, Pier Antonio Micheli who worked so diligently in this garden and who with other passionate naturalists founded the Italian Botanical Society in 1716. This garden is very well known for it’s botanical garden and also for the extraordinary wealth of tree and plant species from all parts of the globe, the old and new greenhouses, not to mention the covered lemon houses which bear witness to this. 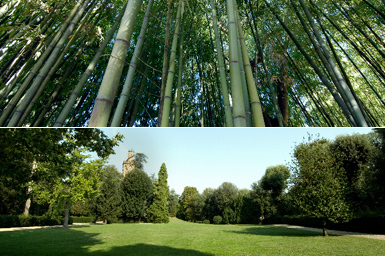 Today the Torrigiani family is still equally committed to preserve and the marble column dedicated to the great botanist and mycologist, Pier Antonio Micheli who worked so diligently in this garden and who with other passionate naturalists founded the Italian Botanical Society in 1716. 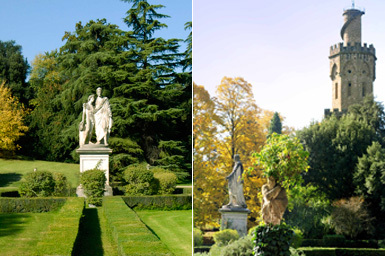 One can walk in the shade of ancient cedars (Cedrus Libani, Atlantica and Deodora,) along the winding paths throughout the garden are many oaks, horse chestnut, cypress, magnolia, plane trees.... and a great and rare Fagus Tricolor.